Left and Write: Oscar who? 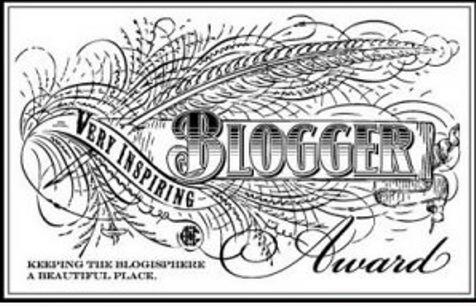 As if the Ninja Captain, himself, Alex J. Cavanaugh doesn't do enough, he's gone and nominated me for the Very Inspiring Blogger award. Alex is a true prince among bloggers...very encouraging and helpful and always willing to lend a digital hand to his fellow writers/bloggers. For someone like that to say that I inspire them, is a real honor. Thank you Alex, I do appreciate it! So, as per the custom of the award, I'll reveal seven things about myself, then pass it on to three other bloggers who I find inspiring. I'm left handed (hence the title of this blog), for the most part. Because my dad would always take things from my left hand and put them into my right, I do some things right handed...such as throw and swing a bat or golf club. Most things, write, eat, swing a tennis racket, bowl, etc., I do left handed. I was a huge pro wrestling fan when I was younger. Had I more drive and ambition, back then, I would have tried to make it a career. It's hard to explain, but I can make my right pinky finger crack on command. It bends normally and silently, but I can also make a knuckle cracking sound with it and it alone. I had a mullet in the 80s.......don't judge. Back in the 80s I also used to love wearing bolo ties. I had a bunch of them. Before it came out I loudly predicted that E.T. the Extraterrestrial, would be a flop. I also said the same about Top Gun. Elise Fallson---Her video post for the "Re-introduce Yourself" blog hop was amazing and one of the highlights of that hop, for me. Jaybird over a The Bird's Nest---I always look forward to her down to earth, no nonsense view on life. Nancy at The Writer's Mark---Always upbeat and always has something interesting to say. Morgan Shamy---She's always encouraging and very helpful. If you haven't already, check out her journey on becoming a writer...it's great stuff. Of course, I could say great things about all the blogs I follow...you're all winners in my book, seriously. Thanks again to Alex for the award! Also, over at Misha Gericke's My First Book, she's taking votes for her Paying Forward Awards. This month, someone was so kind as to nominate lil ole' me for "Best Commentor". I'm in awesome company with Alex, Mark, and M.L. Swift. So, if you haven't already....go over and cast a vote. There are a lot of great folks mentioned and, as cliched as it sounds, I'm just happy to have been nominated. Also a big "Thank You!" to whomever nominated me. Kudos to Misha for getting this going. I think it's a fun and positive way to highlight blogs we might never come across otherwise. Thanks for passing me the award- I really appreciate it Mark. You ARE one of the best commentors! @Jaybird: Or you could just do the opposite of what I recommend for movies. "Why are we seeing this again?" My pleasure and you have a great blog that totally deserves any and all accolades. @Suzanne: Thank you very much! I used to be a fan of wrestling in my younger days too. Nowadays, my son forces me to watch. Congrats on your award!!! I got that one from Allison and then forgot to post . . .aah! Soon, like on Wednesday I think I'll remedy that. And congrats on your nomination too! I'll admit that I don't particularly care for E.T. It freaked me out when I was younger and I've never been able to get over it. Yea, I have issues. Congrats on your award. As far as the righty versus lefty, things like swinging a bat and golf club are determined my eye dominance and not hand dominance. Congrats on your awards. It was great to meet you on my blog today! @J.L. : Thank you! Yes, I stopped watching a few years ago, but have found Lucha Libre to be just as, if not, more interesting. They talk a -whole- lot less. @Laura: Yes, lefties do rule :D I remember when the Farrah style was big. A much simpler time, it seems. @S.P. : I never did either. After it made a liar out of me, I vowed to never watch it! O.k., in reality I've just never sat down to watch it, but I agree....he did look creepy. That "Very Inspiring Blogger" award bestowed upon you by one of my 'starstruck' fans, Alex, is worth more than any Oscar. Thus congrats to you on receiving the award that I think I mentioned in the first paragraph. And well done to all those um 'adoring fans' of mine you bestowed the award upon. Yay Misha! :) Anyway, enough of my delusional comment. I bid thee good day. Congrats on the award! I think we can't judge what anyone did in the 80s. I wore jogging suits to go with the rap stuff coming out. They looked more like cheap leisure suits rather than cool rap star. @Regina: Thank you much, Regina! Look, I'm a leftie... my name is Mark, I used to have a Mullet in the '80s and you shared seven really important things about yourself, like I did. Wow... and if we're Twins or triplets... how lazy was our imaginary Mom for naming us the same? I can also make my pinkie crack on command. Congrats on the award Mark. Talking about all this 80's stuff, it still didn't have anything on all our 70's stuff! Man, them were the days! I have rejoined your followers as owing to Chrome problems all my follower lists disappeared. Congrats! Boy were you wrong about E.T. and Top Gun! LOL! Back in the 90s I was really into country line dancing. I think I was pretty good at it, too. Of course, like anything else, if you stop practicing it goes away. However, at the time, I really loved it!!! Style is a fickle thing... you never know when those bolo ties will come back. Everything does! However, I am not sure that you will want to wear the mullet by the time it becomes fashionable again:( I suppose there are some things we are only meant to enjoy once. And, yes, Alex is pretty darn awesome:) Congrats on your award.